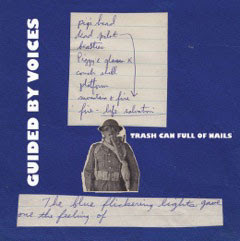 The 3rd, of five singles, released every two weeks in early 2013, leading up to the release of the 4th GBV reunion LP English Little League. Contains one exclusive b-side. Trash Can Full of Nails- reviewed in the English Little League LP. Build a Bigger Iceberg- 4 Tobin Sprout stopping in on the b-side again just to say hello. And again, like most Sprout b-sides in the reunion, this is a welcome, and unfortunately hidden pop gem. Steady, folky-pop with psych drop-ins. Hangover music bliss. Viva la Sprout!